Yes, You CAN Turn Your Passion Into Profit! The Philosophy: "Value No One Can Steal!" "If you create and market a product or service through a business that is in alignment with your personality, capitalizes on your history, incorporates your experiences, harnesses your talents, optimizes your strengths, complements your weaknesses, honors your life's purpose, and moves you towards the conquest of your own fears, there is ABSOLUTELY NO WAY that anyone in this or any other universe can offer the same value that you do!" (2) The #1 MISTAKE people make when turning their passion(s) into profit! Turn Your Passion Into Profit, the book! Take the Passionpreneur Personality Test! • a home maker or retiree in need of extra money? • a frustrated employee desperate to change careers? • a talented, creative person with a gift to offer the world? • a nomad wishing to make money while seeing the world? • a college student deciding on a career? • an entrepreneur seeking additional streams of income? "I hate these people I work with!" "I hate working for someone else." "I wish I could be someplace else doing what I really want to do." "I've got so much more potential that I'm just not using here.." ? Have you ever wondered what your life would be like now if your parents and teachers had encouraged you to follow your gift for sports, or your penchant for art, or your love of animals rather than push you to be an accountant or an engineer or a lawyer? It's an interesting thought to ponder. However, it really doesn't matter. There's no such thing as a wrong decision. There are no mistakes. There are simply choices that offer opportunities to grow and learn from those choices. Every single decision you've made, or that was made for you, has contributed to you being here at this very moment reading this website, ready to make a change. Everything you've learned along the way--even the unhappiness and frustration--will help you to discover your passion and turn it into profit. In fact, by the time you've completed this book, you may want to thank your parents and teachers for giving you the opportunity to discover who you want to be by having successfully shown you who you are NOT. Sometimes your greatest growth comes after experiencing a situation that simply confirms for you the reality that you don't want. Take a passion--something you love to do, something you're good at, something you already have a certain amount of expertise in, something that interests you-- then find the hidden value it has for the public, and then use it as the basis of a way to make money. It's a simple strategy that could be your "Plan A" for your passion-centered lifestyle, or "plan B" during an economic downturn! Find your purpose. Discover your passion. Create a product. Market it for profit. I call it the Cycle of Success! That's the process I've created, developed and explain fully in Turn Your Passion into Profit, the first-of-its-kind book that spawned a host of imitators since I first published it in 1999! (updated every year since). No matter what your passion! What's your passion? Cooking? Music? Animals? Skiing? Singing? Not sure? Well, it doesn't matter what YOUR passion is, if you think you have too many, or even if you don't think you have one! Discovering that passion and then uncovering its hidden value is a process you can master regardless of what your specific passion is or turns out to be. You don't need to buy a book entitled "Turn Your Singing Passion into Profit." This ONE book covers ALL the possible combinations of purpose and passion and product so you can put yourself on the right path to make money doing what you love! "FACT: You CAN make money doing what you love! Even in a down economy!" The Number One Mistake Most People Make When Turning Their Passion(s) into Profit! Let's say you have a passion for cooking. People have been telling you all your life that you ought to open your own restaurant! Sounds like a great idea, right? Well, it might not be! One of the valuable lessons you'll discover in the pages of Turn Your Passion into Profit is to first discover your purpose using the personality test, and then using that information to decide on the best passion for you. I had a client who found herself in that very position. She loved cooking, and was considering starting her own restaurant based on friends' advice. However, I first had her determine she was a "guru" (you'll discover more about that personality/purpose type in the book), and then had her realize that, as a guru (someone whose life purpose is to teach others), that that purpose would be best served by harnessing her passion for cooking and, instead of starting a restaurant, she should instead consider a product or service in which she teaches others what she knows (e.g. cooking school, cookbook, video series, etc.). This is the best way to make sure your business provides you with a higher level of personal fulfillment! You'll learn how to use your passion to help fulfill your purpose, so you don't make this number one mistake that most people make: neglecting to incorporate their purpose into the process. Yes, it's true! I did it! • Yes I did, in fact, do the "nomadpreneur" thing and ran off to China for six months and had the greatest time of my life! "...all of that adventure and my personal success at creating the free life of my dreams started with making the bold decision to turn my passion into profit." "It is impossible to raise your standard of living working a job!" The only way you will be able to satisfyingly change your present condition and move to the standard of living you're dreaming of, and make the sort of money you are ultimately capable of making is to turn your passion into profit. You can only improve so much by working overtime, or waiting for a raise or promotion every year. And with each raise in pay, or each increase in responsibility come more demands and an overall decrease in the amount and quality of free time you have available to really enjoy your time here on the planet. No, the only way to REALLY raise your standard of living while enjoying the life you were MEANT to live is to leverage your talents, your gifts, your interests and your hobbies to create a product or service that you can sell to increasing numbers of people and free yourself from the cycle of trading your time for money--as you might be doing now in a job. Each one of us is given something that sets us apart from everyone else; something that we can do better than others, and that in an ideal system, we can use to not only survive but to thrive. You owe it to your family, your parents, your children, your community, and most especially to yourself to discover that thing, share it with the world and--with apologies to no one--use it to improve your standard of living, your quality of life, and live a passion-centered lifestyle of your dreams! "Simply put, Turn Your Passion Into Profit can help you find your purpose, discover your passion, create a product, and sell it for profit! If you've ever dreamed of earning a living, or just some extra cash doing that one thing that you've always loved to do, then this book/audio is for you!" Since its initial publication in the summer of 1999, and with each revision to incorporate new strategies and technology, Turn Your Passion Into Profit has been selling steadily "under the radar." And while others have come along and copied the title and concept, it continues to stand apart as the innovator, combining spiritual concepts, even health and wellness with practical business guidance to create a wholistic view and action plan for profitable, passion-centered living. No matter what country you live in! I've coached clients in the US, UK, Canada, Ghana, Nigeria, South Africa, Canada, China, Australia and countries on most every continent! The philosophy, principles and formulas for determining a passion's profit potential are universal! It doesn't matter where in the world you are! Furthermore, thanks to the Internet, you can be in Canada and create a passion-centered product that's a hit in Europe! The possibilities are limitless! UPDATED FOR THE NEW YEAR! 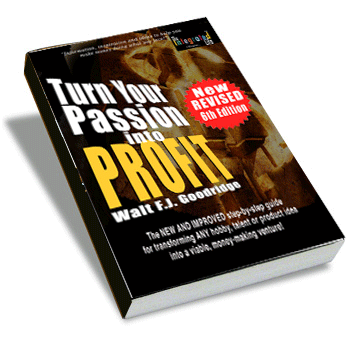 ORDER THE BRAND NEW EDITION OF TURN YOUR PASSION INTO PROFIT! • Updated tax forms showing the latest allowable deductions! • Added: How your smartphone and social networking can make you rich online and you don't even need a website! ORDER NOW AND PREPARE FOR THE NEW YEAR! $12.50 for ebook; $24.95 for PAPERBACK! SPECIAL: Order now and pay only $19.95 for the aperback! Ships within 24 hours! BONUS: Order now and get Ducks in a Row FREE! It's the "prequel" to Turn Your Passion Into Profit and answers in great detail a question I commonly get from coaching clients and workshop attendees who want to know exactly how I did it! THE DEFINITION: ducks in a row: slang. Everything is ready, all preparations are complete. To have everything just the way you want it before you take the next step. Usage example: "I definitely want to quit my job and pursue my passion, but I want to get all my ducks in a row before I hand in my resignation." Sure, we've all seen ducks in a row. The trouble is, watch them long enough and they eventually break formation. 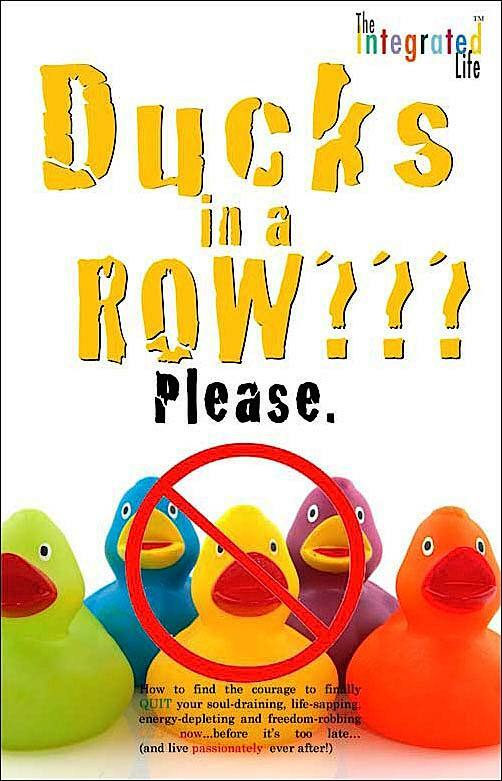 I've never met a set of ducks who liked standing in a row for too long. In other words, if you're waiting for things to be perfect and stay perfect before you act on your dreams in general, and if your success quitting your job and becoming an entrepreneur in particular is contingent on those ducks staying in line for the duration of your adventure in freedom, you might be in for a rude awakening. It's not about the freakin' ducks!! It never was and never will be. If you make it about the ducks, then you've got to keep herding ducks every day of your life. On the other hand, if you practice taking action regardless of what formation the ducks are in, you'll be better prepared for the realities of life and business! It's about finding the courage to do something you need to do whether the ducks are arranged the way you want them to be or not! It's your dirty little secret--a convenient excuse. And I'm going to expose it. The truth is, there ARE no ducks!!! I've already shared that I walked away from my soul-draining, life-sapping, energy-depleting, freedom-robbing job as a civil engineer, to become a passionpreneur and nomadpreneur. In this prequel to Turn Your Passion Into Profit, I'll take you through the step-by-step mental, emotional and physical process of what it took to make that decision, hand in my resignation, burn that bridge, and walk away from my "good job" with no safety net and not even a penny in savings! There was something in particular that gave me the courage to do it, and I'm going to share that with you in all its gory detail! I'm hopeful that as you read this book, something will click for you. "It's not about the freaking' ducks! When you order the paperback or ebook of Turn Your Passion Into Profit, you'll receive Ducks in a Row in the same format of your order! If you order the CD edition, please include a note with your order and let us know which format of Ducks in a Row (i.e. paperback or ebook) you wish to receive. So, whether you call it a "side hustle," a "sideline business," "business on the side", or just a way to make some weekend cash doing something you enjoy, at only $16.95 for the ebook, $24.95 for the paperback, or $49.95 for the 6-CD audio, (each with a money-back guarantee), it's well worth the investment and practically a risk-free endeavor to find out how to start your dream life turning your natural talents, gifts or hobby into a profitable money-generating side business. What are you waiting for? Order one for yourself and give one to your spouse, child or business partner! Order now, direct from my passionprofit.com site, and you can start turning your passion into profit IMMEDIATELY! (c) Join the mailing list and receive THREE free ebooks and the University courses!